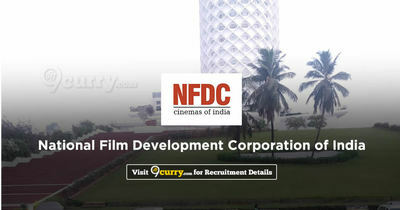 NFDC Recruitment 2019 - Job notification for Deputy General Manager Posts in NFDC, Mumbai, Maharashtra on Deputation Basis. Applications are invited by National Film Development Corporation of India on or before 23 Feb 2019 for 2 vacancies. i) Chartered Accountant/ICWA with 10 years’ experience of which minimum 5 years should be in Managerial position. ii) Accounts finalization in compliance with all statutory requirement, treasury management that includes investments of surplus funds, negotiation with banks/financial institutions for fund based/non-fund based facilities, internal audit, corporate taxation, indirect taxes costing, budgeting, dealing with various auditors, MIS, Forex Management. i) Graduate from a recognized University or equivalent. ii) 7 years’ experience in the media business, preparation and execution of Media plans, knowledge of BARC/TVR ratings, experience relating to Film Industry and Administrative experience in a commercial/business house of a reputed organisation or in a Govt. Office in Managerial position.